Augustus Seymour Houghton was born in Palisades, N.Y. on January 3, 1866. He received his preparatory education at Phillips Academy in Massachusetts, was graduated B.A. at Amherst College in 1888, studied law in New Bern, N.C. and was admitted to the North Carolina Bar in 1890. He studied law under Elihu Root in New York City and was admitted to the New York Bar in 1891. Houghton established his own law firm and practiced in New York City until his retirement in 1948. He was a partner in the firm of Holtzman, Wise, Shepard, Houghton, and Kelly, director of the New Jersey Zinc Co.; Pohatcong Hosiery Mills, Inc.; and the Putnam Trust Co., Greenwich, Conn.
Houghton became actively involved in conservation in 1909 when he was elected to serve as a member of the Conservation Committee of the Camp Fire Club of America, a post he held until 1948. From 1915 to 1918, he served as secretary of the New York State Conservation Commission and from 1928 to 1932 he was a member of the Legislative Reforestation Commission. In 1935, New York Governor Herbert Lehman appointed him chairman of the State Conservation Committee that was to decide whether or not to build truck trails in forest preserves. In 1936, he was elected president of the Association for the Protection of the Adirondacks. He served as director and secretary of the American Game Association. He also served as director of the American Forestry Association, trustee of the American Wildlife Institute, Inc., and was a member of the Society of American Foresters. Houghton assisted in obtaining a treaty with Great Britain, Russia, Japan, and Canada for the protection of Alaskan fur seals and a treaty with Great Britain and Canada for the protection of migratory birds. He also wrote extensive articles of the preservation of wildlife and conservation. Augustus S. Houghton resided in Coconut Grove, Florida during the winter months and as a result became actively involved in the restoration of wildlife in the state. In 1942, the Florida State Chamber of Commerce awarded him a gold medal for his efforts. He died on September 25, 1948 while visiting his son in HyŠres, France. The papers of A.S. Houghton (1866-1948) numbering approximately 4500 items consist of articles, printed matter, newspaper clippings, by-laws, legislative matter, and pamphlets. The material extends from 1905 to 1948 with the bulk of the papers falling within the period of 1929 to 1948. Camp Fire Club of America but they are not a major part of the collection because Houghton corresponded and kept files on a diverse number of conservation and wildlife organizations. The correspondence to and from August S. Houghton is varied and he had several principal correspondents, all of whom shared with him their interest in conservation. His principal correspondents were: John B. Burnham, President of the American Game Protective Association, which later became the American Game Association; Carlos Avery, President of the American Game Association; Seth Gordon, President of the American Game Association; William Greely, leading member of the American Game Association; Erl Roman, Fishing Editor of the Miami Herald; Merlin Mitchell, Executive Secretary, Florida State Fish and Game Association and later secretary of the Florida Wildlife Federation; Jay N. (Ding) Darling, famous cartoonist and leading Florida conservationist; Dr. W.T. Hornaday, Zoological Gardens, N.Y.; Lithgow Osborne, Conservation Commissioner, State of New York; Raymond Torrey, Camp Fire Club of America; and Karl Frederick, President of the New York State Conservation Council. Houghton also corresponded with F.G. Walton Smith, Director of the University of Miami's Marine Laboratory (now the Rosentiel School of Marine and Atmospheric Sciences) and with Spessard L. Holland, Governor of Florida in the early 1940's. His papers are mainly broken into time periods: from 1909 to 1925 lies most of the Camp Fire Club of America material; from 1925 to 1937 lies most of the American Game Association material; from 1930 to 1939 lies the bulk of papers related to the Association for the protection of the Adirondacks; from 1938 to his death, most of his correspondence and other materials were related to conservation in the state of Florida. 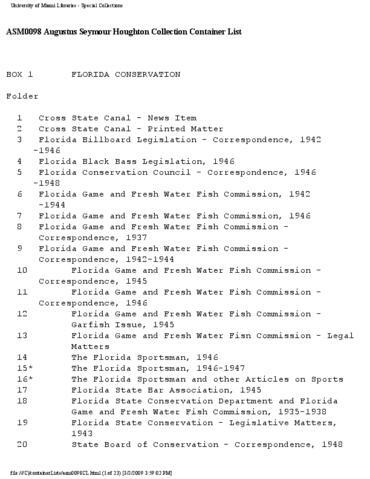 There is a large amount of material on the establishment of Everglades National Park, including correspondence from Ernest F. Coe, conservationist and Chairman of the Tropic Everglades Park Association, David Fairchild, who served as president of said Association, Mrs. Ruth Bryan Owen, the first elected Congresswoman from Florida who proposed the Everglades Park Bill in Congress. The correspondence relates a public polemic between Mrs. Owen and Mr. Coe that very nearly doomed the existence of the park. It should be noted that Mr. Houghton always kept in contact with all the organizations he was a member of through correspondence, printed matter, or otherwise. As a result of this, the collection encompasses a tremendous amount of information on many organizations. Augustus Seymore Houghton Papers finding aid © 1980 University of Miami. Requests to reproduce or publish materials from this collection should be directed to asc.library@miami.edu.